A resident of Be’er Sheva claims he was lucky twice on the same day. The first stroke of luck made him rich, and the second one had his favorite Be’er Sheva soccer team winning a championship game. It was the winner’s habit to go out for the paper at 5 in the morning to pick up the morning paper and read it over coffee. When he had read most of the paper he turned his attention to the lottery results and was amazed to discover he had correctly guessed all six numbers drawn and the special number too. 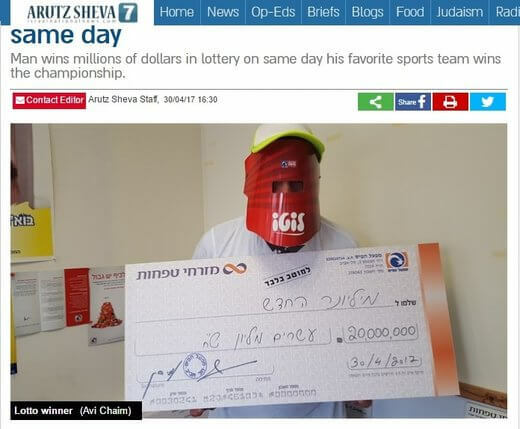 He had won 20 million shekels which is approximately US$5 million! He immediately broke the news to his family and then called his son over. All found it hard to believe he had really won that much. The numbers he used was a combination of birthdays and numbers he considers lucky. He was right! As to what he will do with the money, the man says he does not yet know. Until he does the money is going to sit in a bank.